Back in April of 2013, we brought you the news that General Motors had filed for trademark protection of the engine names LT4 and LT5, and at that point, I speculated that these would be new premium performance engines for the Chevrolet Corvette and Camaro. Of course, that speculation was partially confirmed when we learned that the C7 Corvette Z06 and the 6th gen Camaro ZL1 would both pack LT4 power, but we have continued to wonder what GM has planned for the next LT5. With all of the rumors and spy shots showing what is likely the next Chevrolet Corvette ZR1, we had speculated more recently that the LT5 would power this upcoming super-Vette – since the last application of the LT5 engine designation was used for the unique dual overhead cam engine in the C4 ZR1. The engine of the C4 ZR1 played a big role in the success of that classic Corvette, so with the introduction of the C7 Corvette ZR1, it would make good sense that the LT5 name would be revived to once again play a big role in the success of an American supercar. That doesn’t seem so likely with this new information on the next LT5 and its Corvette application. So, it should be noted that this fresh information on the use of an LT5 engine in the future Chevrolet Corvette is, of course, unofficial. GM wont comment on information like this and with no word from the automaker about the existence of a new LT5 V8, this is far from an official statement – but in terms of unofficial information, this is about as good as it gets. These new bits of info come from the General Motors service website, which is a resource for dealerships around the country. Buried in the many pages of information is a listing for an LT5 engine with the model designation letter Y. It just so happens that in the GM service system, Y is the designation for the Corvette, so in short, the dealership service system references a modern LT5 engine for the modern Corvette. Unfortunately, there is no model year or trimline information, but we know that GM has at least taken the time to lay out the new LT5 in the dealership computer system. What we do know from the service website listing is that this new LT5 will be an all-aluminum V8 measuring 6.2 liters and featuring direct injection. More importantly, this new engine has a dual overhead cam setup where the LT1 and LT4 are pushrod engines, and, sadly, there is no mention of forced induction. In short, the new LT5 is an all-aluminum, naturally aspirated, dual overhead cam 6.2L V8 with direct injection, which sounds like a perfect reincarnation of the LT5 from the C4 Corvette ZR1. The only “problem” is that if this listing proves to be accurate and the new LT5 is naturally aspirated – it is almost certainly not the heart of the C7 Corvette ZR1. If the new LT5 is a naturally aspirated engine, it means that the new ZR1 will not be a high performance monster like we all expected, or the new LT5 isn’t the engine of the new Corvette ZR1. It is widely expected that the C7 Corvette test car captured in pictures and videos will be the next ZR1 and it is widely expect that the C7 ZR1 will pack far more power than the current Corvette Z06. This means that the C7 ZR1 would need to deliver at least 660+ horsepower and the likelihood of GM getting that from a naturally aspirated, 6.2L engine isn’t very good. Realistically, the new ZR1 will almost certainly have a supercharged or turbocharged engine, meaning that the new LT5 has to be intended for some other Corvette. The speculation around the automotive water cooler is that the new LT5 will be the powerplant for the long-rumored mid-engine Corvette. If GM was to create an ultra-light mid-engine Corvette, they could go with a new, naturally aspirated LT5 will somewhere in the area of 500-550 horsepower and while that would fall well short of the 650hp in the Z06 – the mid-engine Corvette would clearly have a different design direction than the Z06. 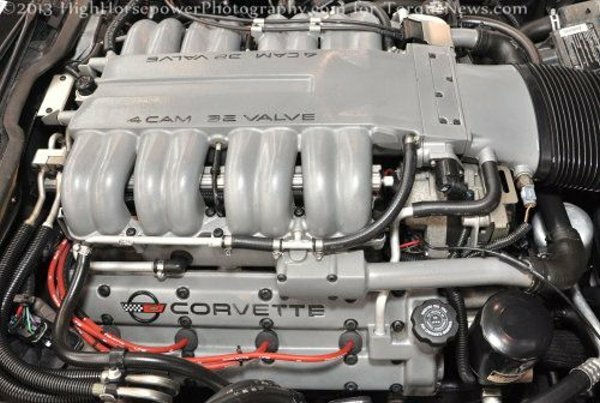 Finally, there is the possibility that the new LT5 could be the next generation Stingray engine, but it seems unlikely to me that the “base model” Corvette engine would shift to DOHC after so many years of success with pushrod engines. It looks more likely than ever that the LT5 will make a return, but as a naturally aspirated, DOHC engine, it is hard to guess what GM has in plan for their next new small block V8.